South Korea comes out far ahead in first place. 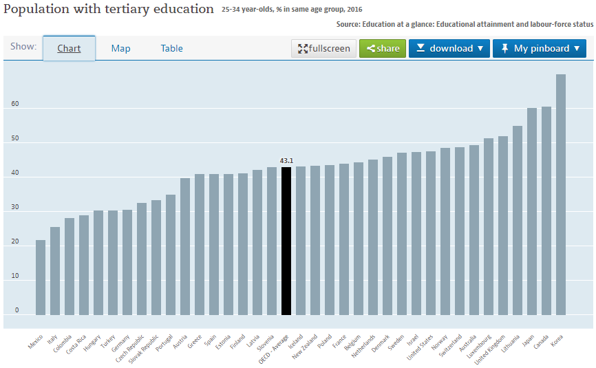 Where in the world is the most educated country? 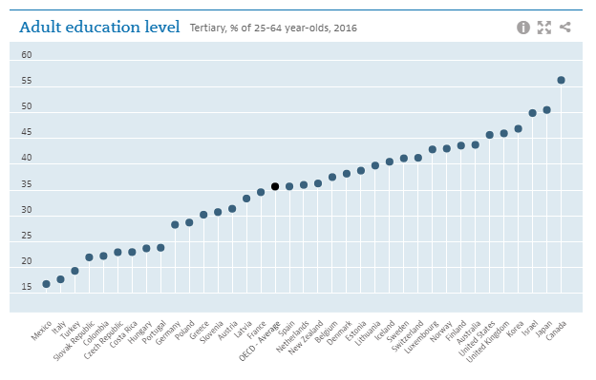 It’s South Korea, according to the OECD’s assessment of the percentage of people between the ages of 25 and 34 who have completed tertiary education. Levels of higher education are becoming increasingly important as globalisation and technology reshape the needs of labour markets. South Korea has invested heavily and the share of public expenditure on education increased by 10 percentage points between 2005 and 2014, according to the OECD report, with spending up in primary, secondary, and tertiary education. There’s a focus on science and technology subjects. 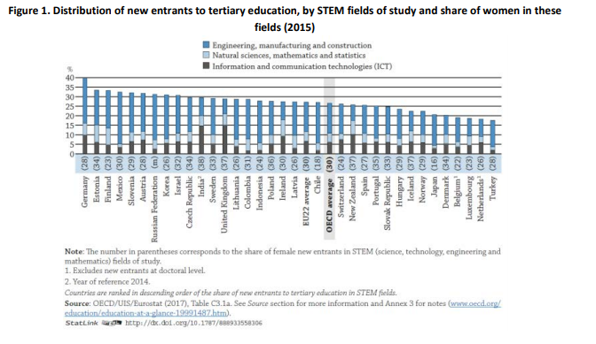 South Korea’s share of graduates and new university entrants in engineering, manufacturing and construction is much higher than the OECD averages. 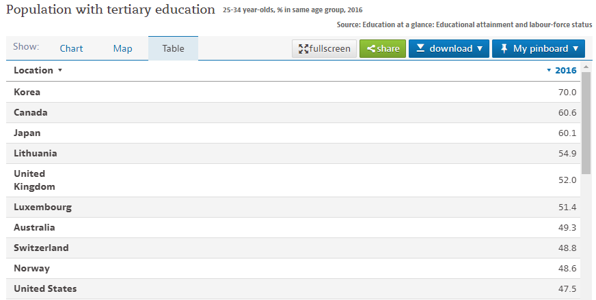 Canada is second on the list, with 61 percent of 25-34 year-olds holding a tertiary qualification. Even so, while the nation has a large share of higher-educated adults, few continue beyond a bachelor’s degree, the OECD statistics show. Third on the list is Japan, which sends a large proportion to higher education, even though fees are high. At tertiary level, only 34 percent of the total expenditure on educational institutions comes from public sources, compared with the OECD average of 70 percent. Households foot most of the bill, contributing 51 percent of expenditure on tertiary education, more than twice the OECD average. Lithuania is fourth on the list. Here higher education attainment rates have increased largely over the past 15 years as expenditure on tertiary institutions expanded to exceed the OECD average. In fifth place is the U.K., which spends the highest proportion of its wealth on primary to tertiary education, according to the OECD. As well as an above-average share of public spending, a large portion of funding comes from private sources. In the second half of the top 10, Norway is the only Scandanavian nation to feature, alongside Luxembourg, Australia, Switzerland and the US. Perhaps surprisingly, despite being almost universally admired for its education system, Finland doesn’t make the top 10. When taking in to account people aged between 25 and 64, Canada topped the list, followed by Japan, Israel and Korea. Finland — where tertiary students don’t have to pay fees — does make the top 10 in this case, coming in at number eight. The World Economic Forum on ASEAN is taking place in Ha Noi, Viet Nam from 11-13 September 2018.